Mike was all about the passion, probably more than anyone else I know. I first met Mike while we both were working for a local software company. I didn’t know him very well at the time but watching him ride into work on his bright and shinny Honda Shadow prompted me to ask questions. 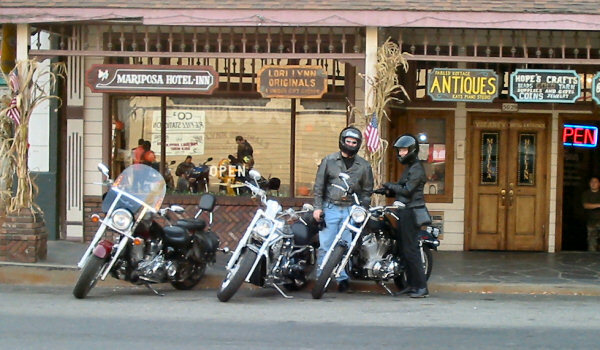 Mike and I started swapping stories about riding, all the while I dreamed of someday riding again as I’ve loved it so much in the past.We became friends, played video games and went to a few races. The bug had caught me once again and I could not wait any longer to start riding again. 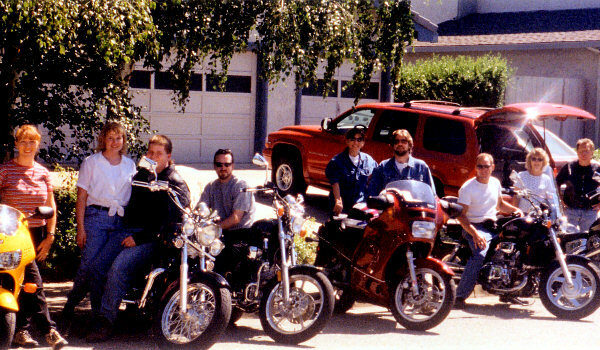 The minute I bought my bike, the first thing I wanted to do was ride over to Mike’s house. 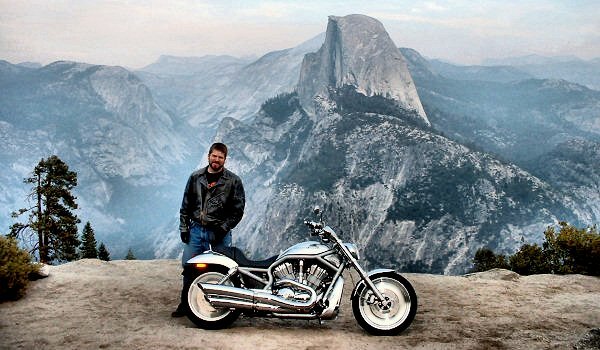 I dragged him out on our first ride; I can still remember the sites, smells and that overwhelming feeling of freedom the night had brought. Since then we have be on many rides together. 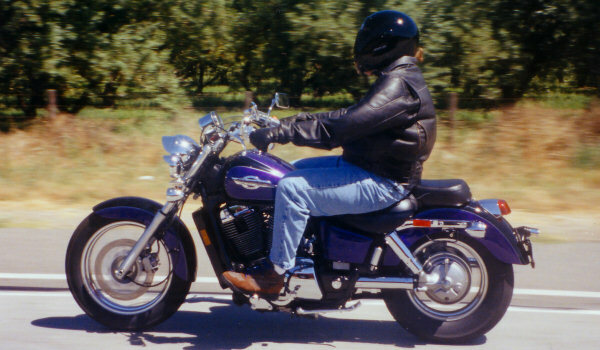 Mike and I share that certain love of being out on the open road. It didn’t matter much to us where we were going, only that we were taking the bikes to get there. Below you’ll find some of my favorite shots of Mike as well as my thoughts for the day I posted them. 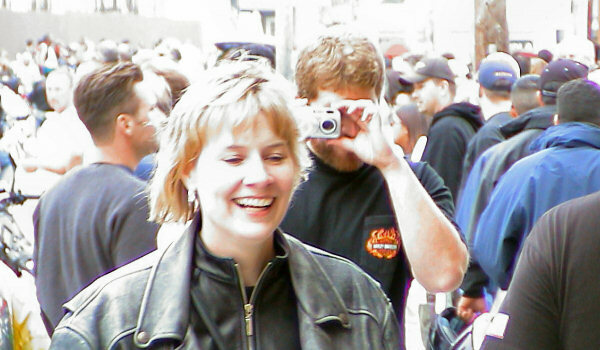 Mike was never comfortable in front of the camera so the pictures I do have I cherish with all my heart. I would not be the man I am today if it wasn’t for meeting Mike. He was truly one in a million and one of the finest men I have ever known. Seldom do you find that one true sole that makes this world a better place. Mike truly represents all that a man should be and a man I can only aspire to be. I am so thankful for the time we had together and I will cherish those memories forever. Today they buried my friend. Although our lives have led us on our own separate paths, Mike and Shannon have always been a big part of our lives. 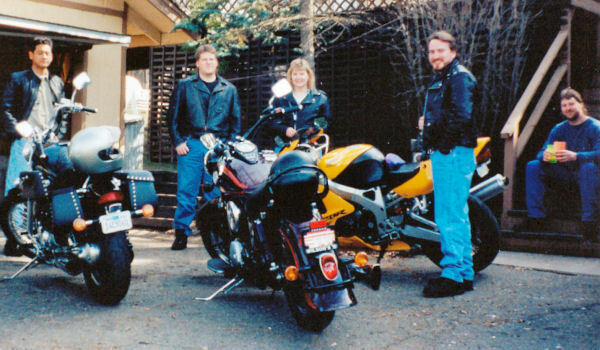 Through the years we’ve shared some great times, most of which have been centered around our shared love for motorcycling. It didn’t matter to him where we were going, only that we get there on two wheels. For now, we’ll still ride the same roads we once shared together, only this time he’ll be traveling in my heart. It’s been two weeks since I heard the horrible news. During that time I have traveled on some of the same roads Mike and I have shared so many times before. I visited some of our favorite lunch time burger joints, and filled up the tank at the same old gas stations. It may seem silly, but all these places have new meaning to me now. Something as simple as filling up the tank, reminds me of the way things used to be. It’s been more than a month now, I recently returned home after a weekend at Laguna Seca. It was a weekend of mixed emotions as the excitement of the MotoGP coming back to America was not the same with Mike’s absence. Although Mike and Shannon didn’t make it to the races every year, the times we shared during the events surrounding Laguna will stay with me forever. 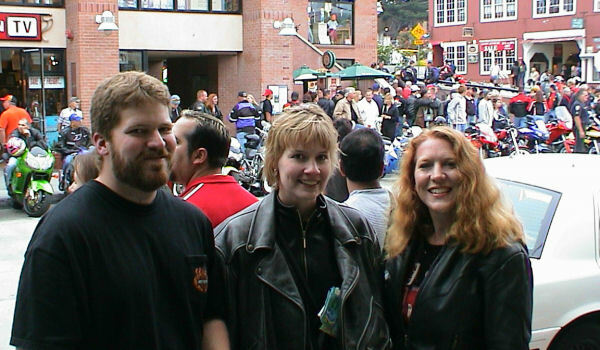 From the first time we drove (blasphemy) to the AMA races back in 1998, to our last trip together in 2004. 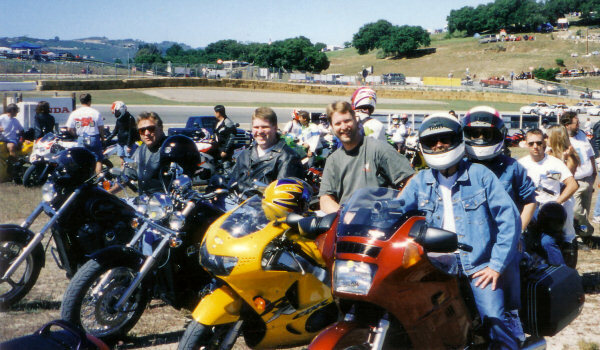 I have a lot of fond memories of Mike and our trips together, our ride to Laguna Seca is one that I will truly miss. It’s been well over two months now and we just held our 1st annual Friendship ride in honor of Mike. I still have a hard time believing that I’ve been busy planning such an event for my fallen friend. As I ride past the places he lived and roads we once shared together, I sometimes find myself thinking of Mike as if he is still alive. Those thoughts are quickly ended when I catch myself and then reality comes crashing down. I know I’m just fooling myself but during that brief moment, in my heart, I do believe that he is still here. I still welcome those thoughts even though I know they are all in my head, and sadly they won’t be around forever. Days like these are harder than the rest as the events that transpired on this day only three months ago still fill my heart with great sadness. Each day I try to regain at least one new memory of Mike that I may have misplaced somewhere in my memories. Posting my pictures and comments here, seem to help me through the tough times and I hope that through these messages, others may remember their forgotten memories of times they have shared with Mike. Special memories that will last a lifetime. Another 8th as six months passes. During these past months I have had the opportunity to speak with many of Mike’s family and friends. I soon realized that I only knew Mike for a very short time compared to those who knew Mike as he grew up in Alabama. Mike left such a lasting impression on so many people, a true testament to the kind of man Mike was. Son, brother, husband and friend… you will be remembered so differently by all those you’ve touched. Here’s one friend who will be remembering you during this holiday season. My best wishes to all of Mike’s family and friends, and I thank you so much for sharing your time and stories with me. Today would have been Mike’s 34th birthday. For the first time my words fail me as I can’t seem to put into writing the emotions I’m feeling on this day. 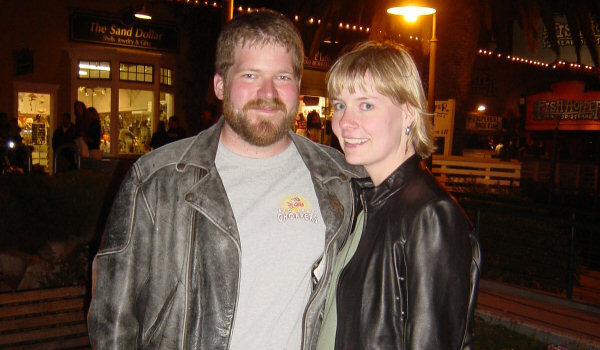 This is one of my favorite pictures as it was taken on our first trip to Laguna Seca. We’ve since been on many fun adventures which have proved to be some of the best times of my life. Today I remember these times with tears in my eyes, tears of both happiness and sorrow that will never diminish. One Year… A lot has happened in this past year, but the power brought forth by good friends and family have got me through the tough times. I thought a lot about what I would do when this day finally arrived. I’m not one to dwell on such days especially when there are so many other great days to remember, but sometimes no matter what you do the memory of what happened on this day just one year ago still manages to fill your head, heart and soul. This picture may not seem like much. 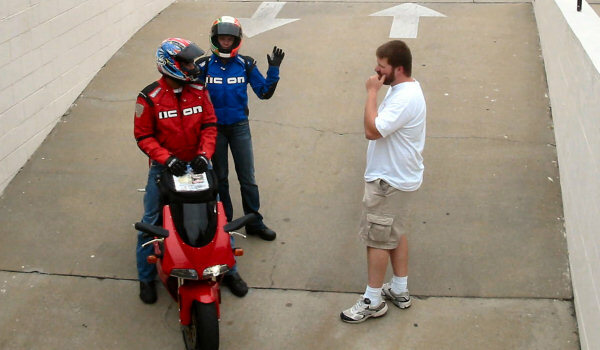 It’s just a shot of Mike welcoming a few friends as they arrived at the hotel during the superbike races in 2004. Simple, but this is one of my favorite pictures of Mike as it shows him wearing shorts. Until this day, I only knew him as blue jeans and t-shirt Mike. I sure gave him a bad time about his new attire, but Mike always took it well, and saved some of his best witty retorts for his well planned retaliation. I’m not sure how others plan on remembering this day, but I choose to spend it doing what we loved best. I plan to spend the day riding some of our favorite roads. Revisiting some of those familiar sites we once shared together. Most of all, remembering all the great times I spent with a good friend. I miss you Mike.